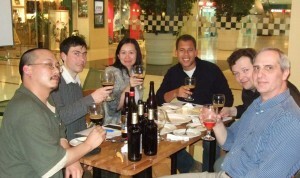 In late April, I was proud to showcase a few select beers for several invitees from the English-language media in Beijing. Amongst them were Annie Wei from Beijing Today, Gabriel Monroe from Agenda, and Greg Williams from City Weekend. We were also joined again by Jim Boyce and by Frank Siegel, who graciously hosted the event at the new Kerry Center location of Sequoia Cafe.